Navicat for MongoDB includes GUI Designers for both Users and Roles. We were introduced to the User Designer in the last blog. Today, we'll learn how to edit user roles using Navicat's Role Designer. General Properties: Role Name: Defines a name for the role. Built-In Roles Use this list to assign the role to be a member of the selected built-in role. 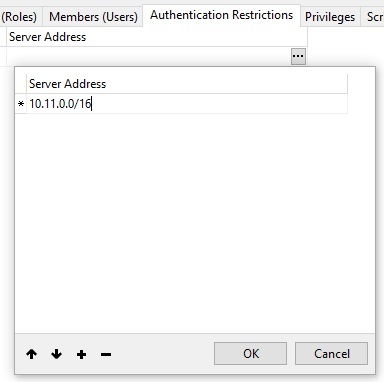 User-Defined Roles Use this list to assign the role to be a member of the selected user-defined role. Members (Roles) Use this list to assign the selected role to be a member of this role. Members (Users) Use this list to assign the selected user to be a member of this role. 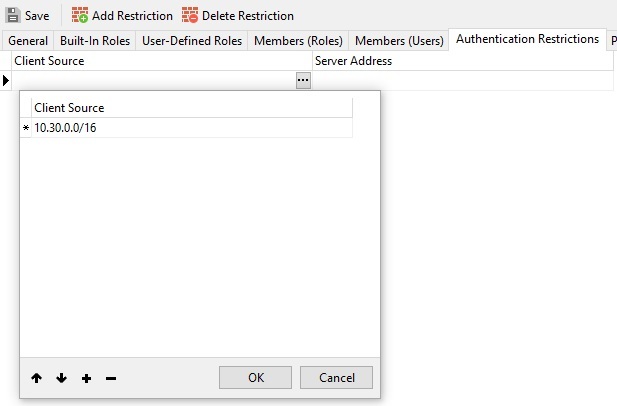 Authentication Restrictions To edit specific authentication restrictions that the server enforces on the role, click Add Restriction. Client Source Specifies a list of IP addresses or CIDR ranges to restrict the client's IP address. Server Address Specifies a list of IP addresses or CIDR ranges to which the client can connect. New to version 3.6, an authentication restriction specifies a list of IP addresses and Classless Inter-Domain Routing (CIDR) ranges from which the user is allowed to connect to the server or from which the server can accept users. clientSource	is an array of IP addresses and/or CIDR ranges. The server will verify that the client's IP address is either in the given list or belongs to a CIDR range in the list, when one or more values are present. If the client's IP address is not found, the server will not authenticate the user. serverAddress is an array of IP addresses and/or CIDR ranges to which the client can connect. If one or more values are present, the server will verify that the client's connection was accepted via an IP address in the given list. If the connection was accepted via an unrecognized IP address, the server does not authenticate the user. Don't forget to click the Save button to save the updated role!